One thing that always makes my life feel much less overwhelming is having a dinner plan. I can always tell when I’m letting my meal planning or dinner prep fall apart, because I just have this low-level anxiety all afternoon as dinner gets closer and closer and I have no clue what we’re going to eat. For me, the ultimate is a crockpot meal. I love that I can just toss everything in first thing in the morning while the girls eat breakfast and then I don’t really have to think about it again for the rest of the day. Heaven! Plus, nothing makes me feel more on top of my life than knowing dinner is taken care of by 8:30 a.m.
And winter is such a cozy time for stews or hot sandwiches that make your house smell amazing. Maybe that’s just because I want more time to snuggle up on the couch with a blanket and a stack of books. Either way, these are twelve of my favorite slow-cooker meals that I plan to have in heavy rotation all winter long. This is basically Bart’s favorite meal on earth. Also my girls all love it, and then can’t really understand what’s going on when we have sandwiches that don’t have a dip. And so freaking easy. This one is SO delicious – I love how hearty it is and it couldn’t be easier. It’s not spicy, but it’s loaded with flavor. I made this more times last winter than I can count – everyone would eat it and it was the perfect vegetable-packed dish that everyone would eat. And your house smells like heaven. I love a good tortilla soup in summer or winter, and this one is a stand-out. Simple and packed with flavor and just the best easy dinner that everyone likes. We don’t eat a lot of vegan dishes around here, but this one has remained a long-time favorite. Of course, we cheat by loading it up with sour cream and cheddar, but either way it’s fantastic. If I had to choose a very favorite dinner, it might be these sandwiches. Oh man, I never get tired of them – they are SO good. If we have extra meat leftover, I scramble them with eggs for breakfast or put them in a tortilla shell. I’ll admit that regular chili doesn’t do a lot for me, so I was skeptical about this one, but it’s turned out to be a family favorite. It’s just AMAZING. Jalapeño poppers make me think of football season, even though I am probably the least enthusiastic football fan on the planet. If I ever got invited to a football-type party, I would totally bring this, but as it is, I just make it for dinner and forgo any football related anything. I love a sweet note in a savory main dish and this one is perfect. I made this a few times and then kind of forgot about it for a couple of years, and then when I made it again, Bart said, “I’ve been remembering this meal for the last two years! I’m so glad to have it again!” Now I don’t make the mistake of waiting two years in between making it. This is the first recipe on my blog that really went viral and it got tens of thousands of well-deserved repins. I’ve made it dozens of times over the years, and every time I love it just as much as I did the first time. It’s also my go-to meal when I need to take dinner over to someone. This is rich and creamy but not because it’s packed with cream – the pureed vegetables and beans make it that way, and it’s amazing. I first made this to use up some leftover ham, and it was so ridiculously good, I started buying ham just for this dish. 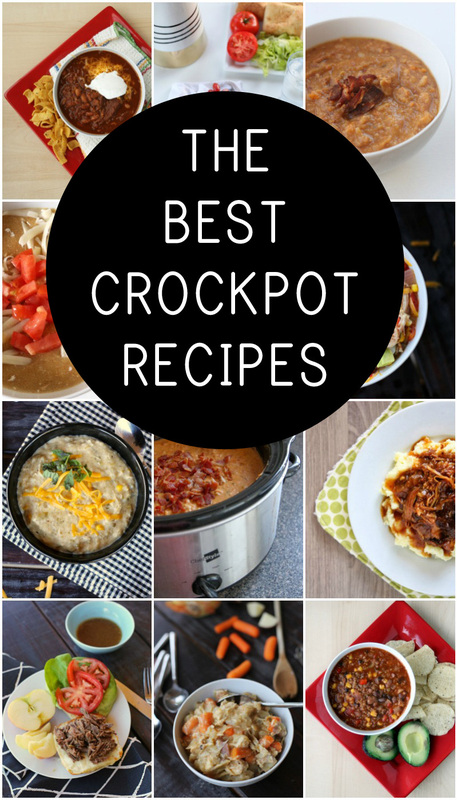 And if you have favorite crockpot meals, I’d love to hear about them, because basically I’d like to be making a crockpot dinner 6 times a week (and then leftovers on the 7th day!). Thank you for the great list! One of my favorite crockpot recipes that I usually end up just simmering for 15 minutes to make is this one: https://www.lecremedelacrumb.com/slow-cooker-broccoli-beef/. These all sound amazing! Thanks for giving me lots of meal planning ideas for the next few weeks. One of our very favorite meals lately is Mel’s Kitchen Cafe sweet balsamic glazed pork. https://www.melskitchencafe.com/sweet-balsamic-glazed-pork-loin-slow-cooker/ I’ve only made it in my pressure cooker, but there are slow cooker instructions, as well. It’s so tasty! I feel like this post is for me 😉 So many tasty looking things! I can’t wait to try some of them in the instant pot! These look great (and having tried some I know that they taste good) and just what I need heading into the New Year. I would guess that they would serve about 6 or so as is, so I plan to double them, either to have leftovers on hand or to feed a crowd. The crockpot is my sanity saver in the winter especially! My favorite are the days where I’ll fill it and plug it in, leave the house, and then come home hours later COMPLETELY surprised that supper is cooking. Like once I take care of it I put it out of my mind. It’s always such a delightful surprise! Your shredded beef sandwiches are a family favorite in our house! I loooove my crockpot. Just pinned this. Thank you and happy new year!